Last month felt as painful as giving birth to a baby sumo wrestler. No, I’m not pregnant, but for the amount of pelvic pain I had to endure, I could’ve busted a baby out. During one week in September, I felt like a baby Sumo was side-kicking me from inside my belly. 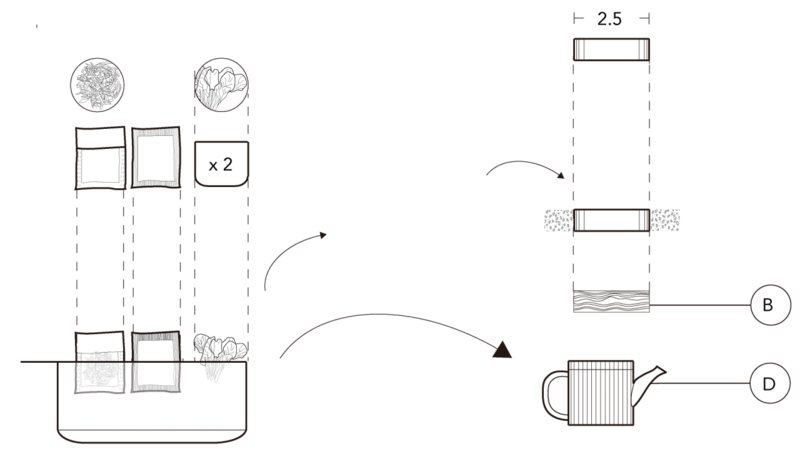 During the last week of September, my interior design team called a taxi to take me to the nearest hospital. Over the past few months, I’ve struggled in communicating with various Japanese doctors; I’ve had plenty of “Sorewa nandesuka? What is that? Ow, F-!” moments. The pain I feared most was being alone, completely covered in curtains, with unknown objects being inserted into places of pain in me I can’t see… by people I can’t understand. Yet I’ve learned over the years that the time of being in excruciating pain is the ultimate worst time to be afraid and frustrated. That is the crucial time to be strong and patient. Thanks to this old Japanese doctor with her magic drugs and support from my design team and you friends, I’ve slowly and surely recovered. 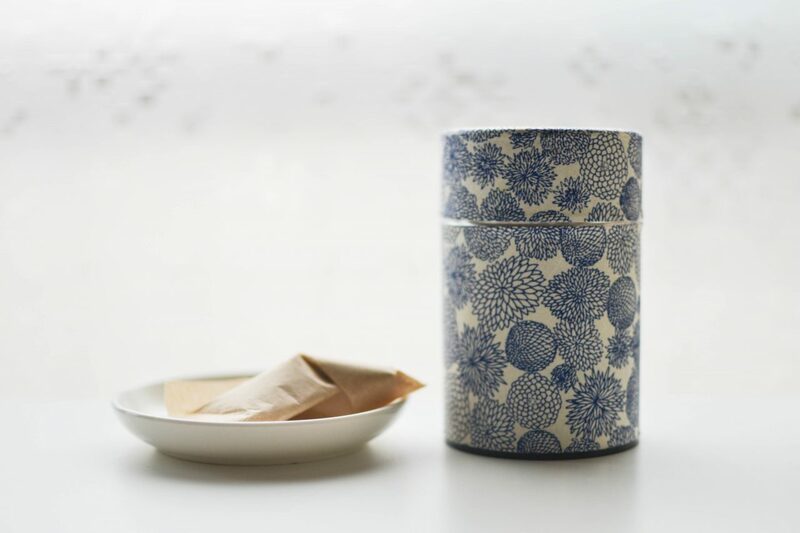 My previous coworker, Japanese brother Senda-san shipped to me this gorgeous chazutsu (tea container) and dashi (Japanese soup base) packet from Tsukishima. I decided to stay at home and stir Senda-san’s dashi broth in a 1:1 ratio with my genmaicha (green tea with roasted rice). 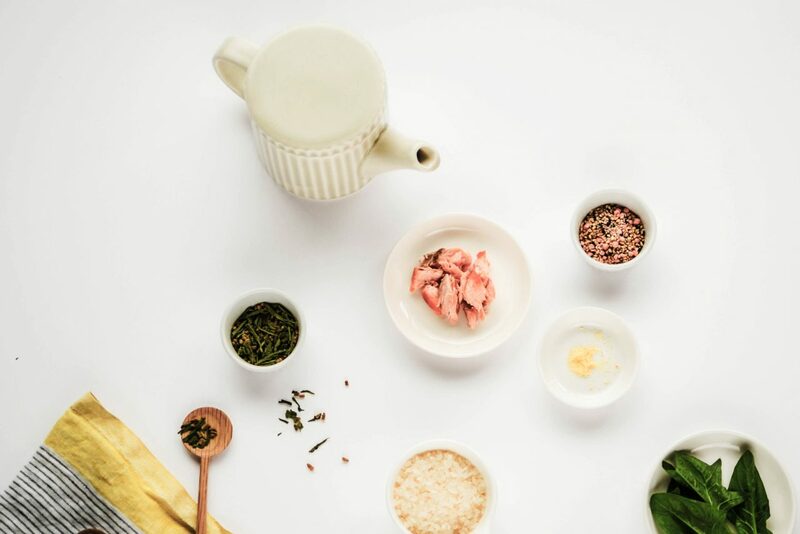 And now, I’ve used this soothing broth to make something more flavorful and comforting for my belly and your belly. It’s called ochazuke. Although this is a traditional get-well soon/cold-weather dish, anyone at anytime can benefit from ochazuke お茶漬け. The dish’s name consists of two words: Ocha (お茶) meaning tea, and zuke (漬け) meaning submerge…. 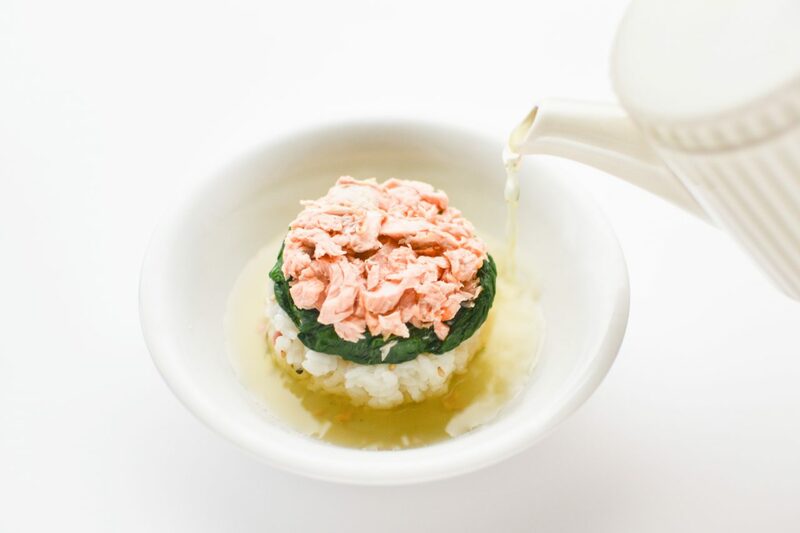 Ochazuke is the healthy and delicate Japanese comfort meal that consists of green tea and dashi broth being poured on rice. There are so many variations of this classic and the toppings are limitless. These ingredients can also be found in your local Japanese supermarket. 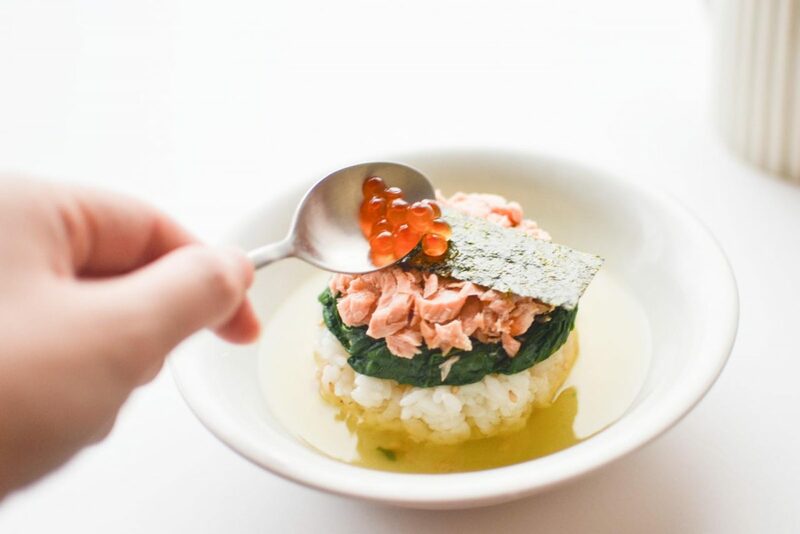 Since I’m a devout fan of precise measuring, stacking objects, and consuming sake-ikura (salmon caviar) I’ve created this recipe to help heal and comfort our bellies. 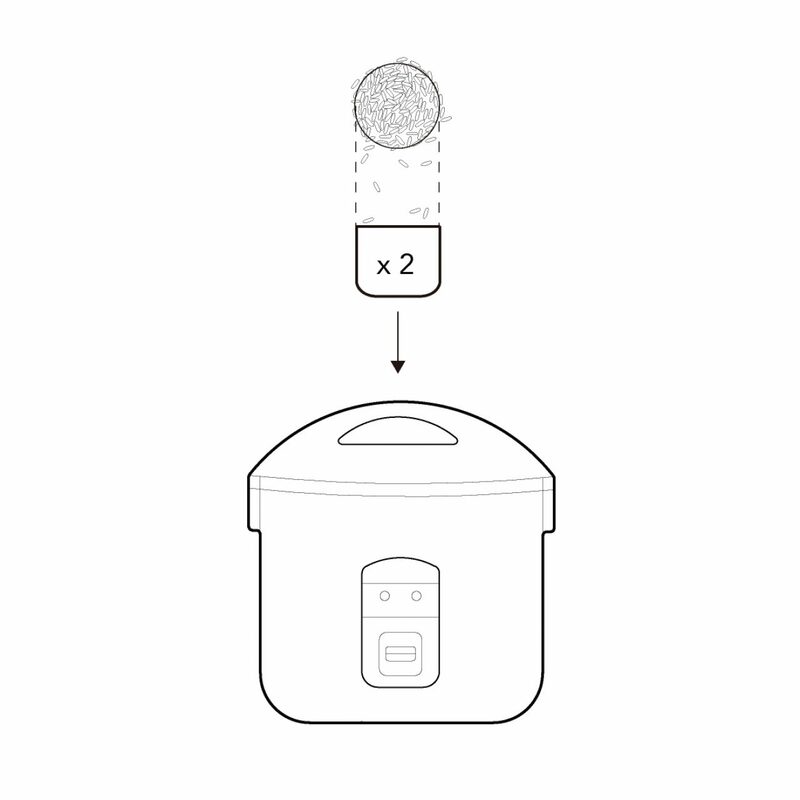 Cook the 2 C rice according to your rice cooker’s instructions. Meanwhile, prepare the salmon. Sprinkle and rub in desired amount of salt on both sides of the salmon filet. 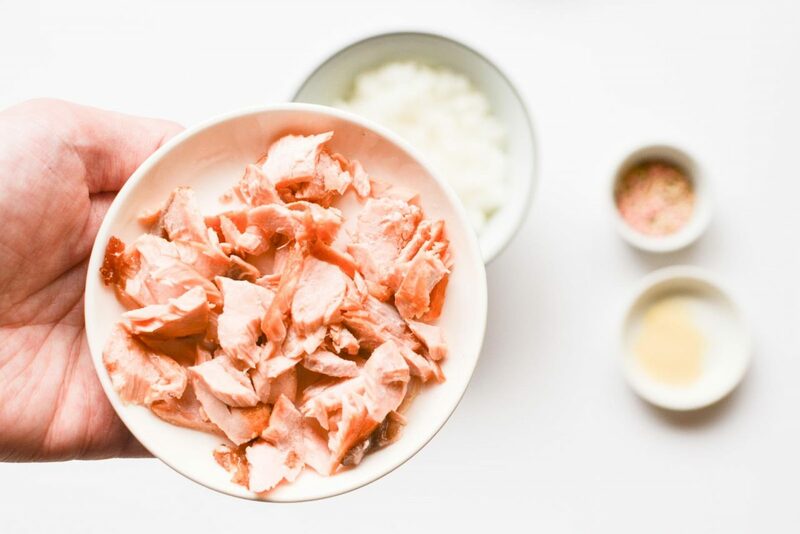 Heat approximately 2 tbsp of oil into a frying pan and cook the salmon (skin down) until the skin crisps and browns. Continue to cook the salmon so that it browns on both sides. 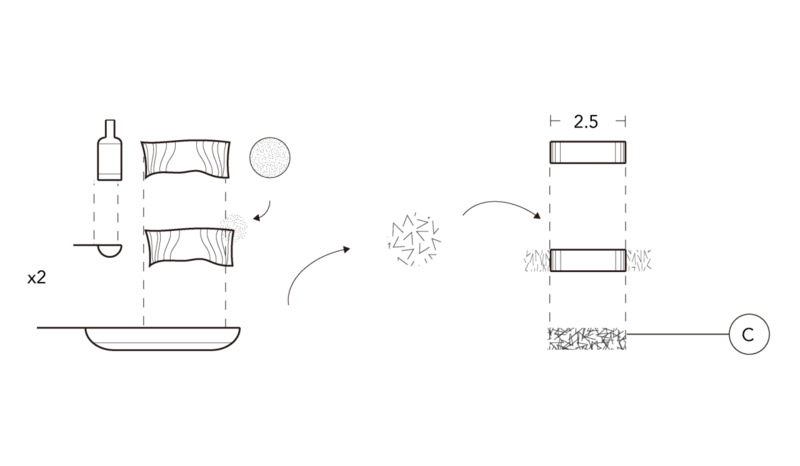 Remove from pan and shred into smaller pieces on a plate. 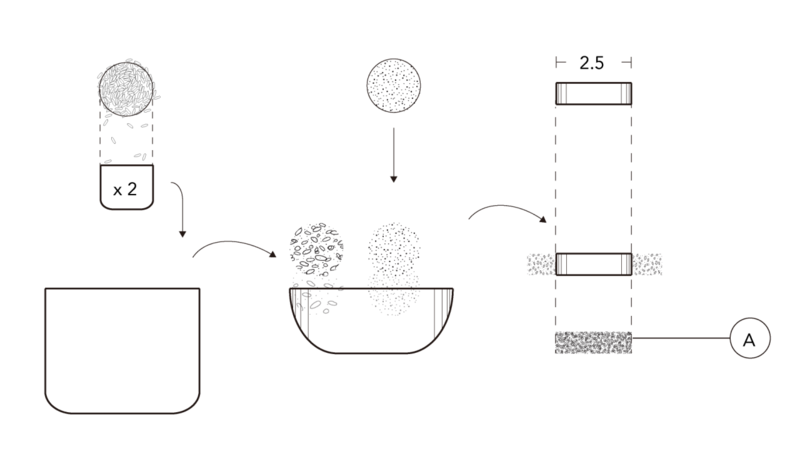 Once the rice has cooled, transfer about 1 C of cooked rice onto a shallow bowl. Mix in desired amount of furikake into the rice. Use a 2 1/2″ cookie cutter to cut out a 2 1/2″ disc for the rice / component A. Prepare ochazuke broth and the komatsuna by boiling about 3 C water into a pot. 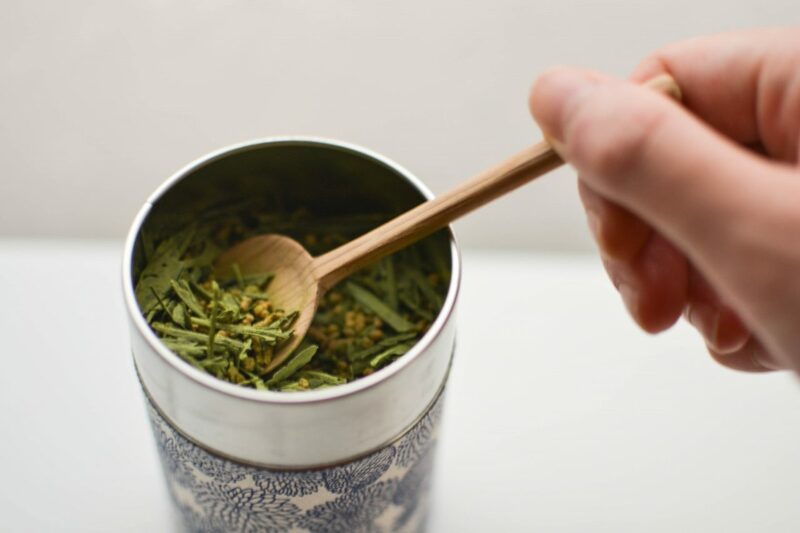 Once the water begins to boil, place one dashi packet and one genmaicha packet (or other roasted green tea) for 5 minutes. Blanch about 2 C of vegetables into the pot, then separate the vegetables aside to dry with a paper towel. 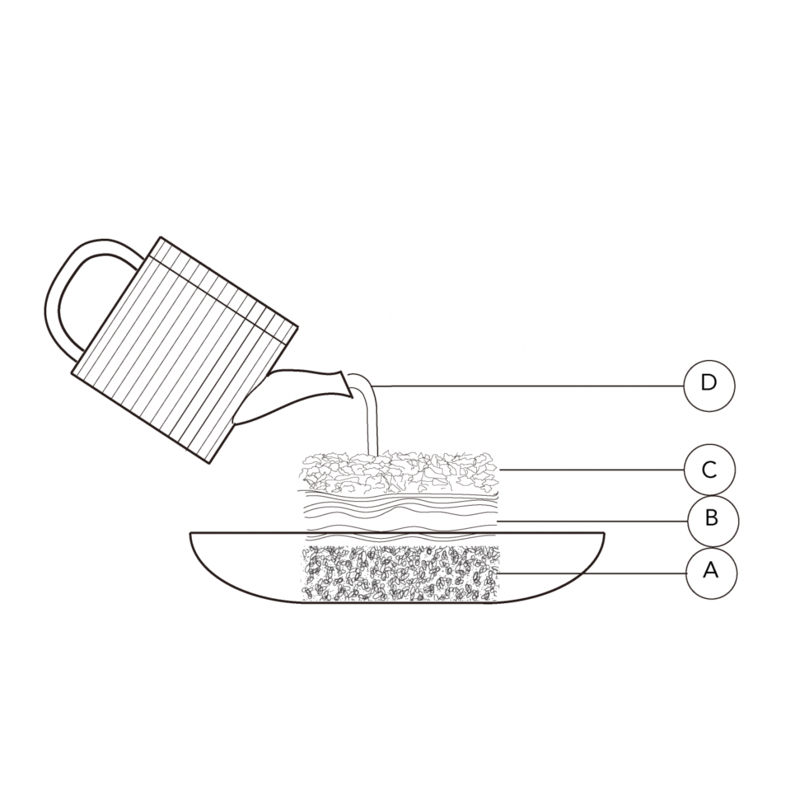 For easy pouring, transfer the broth to a teapot or bowl. To assemble the first layer of ikura ochazuke, transfer about 1 C of cooked rice onto a deep plate. Cut out a 2.5 in. disc from it by using a 2.5 in. cookie cutter. 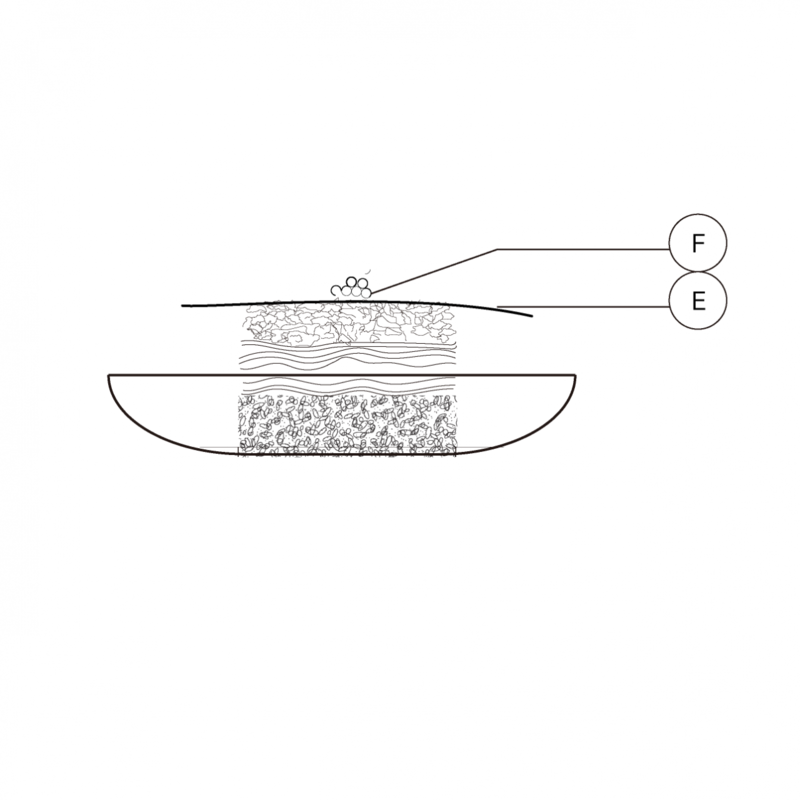 Remove the remnants from the plate and continue to stack ingredients with this technique. Add the strip of nori, a small dollop of ikura (or your favorite ochazuke toppings) and slowly pour desired amount of the broth. Itadakimasu! Teapot and dinnerware from 4th market, kitchen towel from Lino e Lina, and wooden spoons delicately hand-crafted by and given from Tim Roberts.